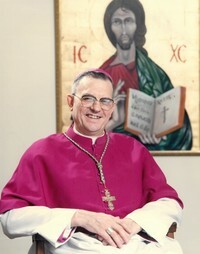 Most Reverend Bishop Attila Miklósházy, S.J., was born on April 5, 1931 and died on December 28, 2018 Bishop Attila Mikloshazy lived in the Jesuit Infirmary at Pickering, ON. He suffered from multiple ailments, which required his transfer to Rene Goupil House. At St. Augustine's Seminary he had served as Dean, professor of liturgy and historical theology. He also ministered Hungarian expatriates around the world. He celebrated his Golden Jubilee of priestly ordination. I knew him since 1965 and he was a man of great faith, tremendous wisdom and much spirituality...and also a gentle, good-humored and very kind, caring friend to our family.